capable of making sustained measurements of upper ocean temperature and salinity. The program builds on the successful use of profiling float technology currently deployed in the global fleet of Argo floats. Profiling floats contain a buoyancy engine that propels the float up and down in the water column. Sensors on the float measure temperature and pressure as the float ascends, recording a profile of ocean temperature. When the float reaches the surface, an antenna extends above the waterline to make contact with satellites in order to determine location and to send data back to shore. 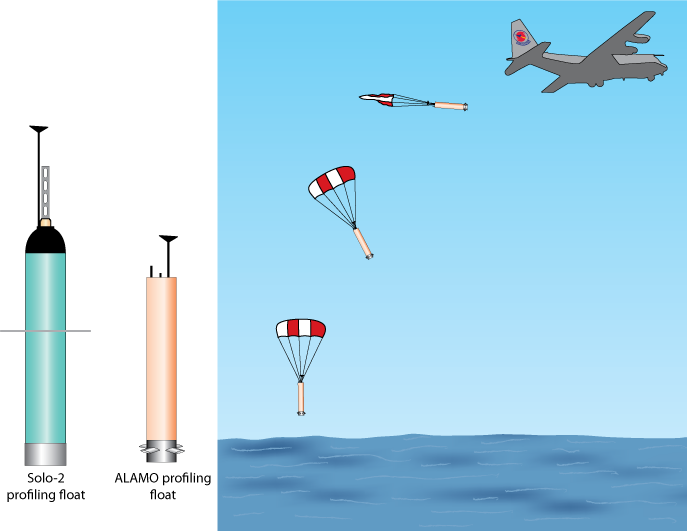 A key feature of the ALAMO program is miniaturization of all the components in order to reduce the overall size of the instrument to dimensions, which can be deployed via a Sonobuoy-A size tube on an aircraft. Capability for aircraft deployment provides for rapid-response deployments necessary for studying hurricanes and other storms. Rather than mustering a slow moving ship, air-deployable floats can utilize Hurricane Hunter type aircrafts to seed large numbers of instruments in and around developing hurricanes. Unlike other sampling methods, which observe only one profile, a profiling float will linger in the area long after the plane has gone, continuing to make measurements in real time to the forecasting community via the Global Telecommunication System (GTS) and Internet. The current generation of ALAMO floats is capable of making ocean observations from 1 to 6 months, depending on sampling rate and depth of profile. This will allow observations of the evolution of the ocean’s temperature before the passage of a storm (to improve the intensity forecast of the storm), during the storm (to observe the ocean mixing and development), and after the storm (to measure the subsequent restratification of the ocean).